Adhesive (PRESSURE SENSITIVE): Adhesives can be Acrylic or Rubber based and are tacky at room temperature. Bleed: Bleed is the printed image beyond the edge of the labels die cut. Cylinder: Cylinders are used in Flexographic printing to mount plates that make the impressions on the facestock. Die: A die is a cylinder used to cut the desired shape of the label. Die Cut: A die cut label creates space between each label and can be used to cut a variety of shapes into the facestock. Die cut labels include squares and rectangles with rounded corners, circles, ovals, and special shapes. Embossed/Debossed: Embossed refers to the image raised above the surface of the label and debossed refers to the image below the surface of the label. 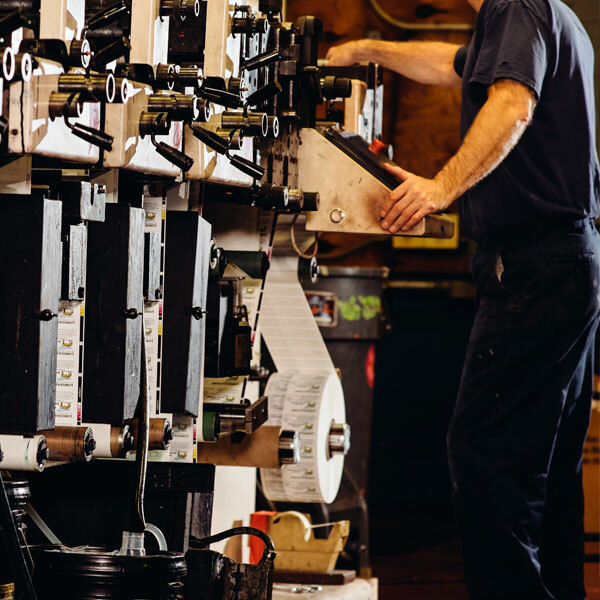 Flexography: Flexography is the method of printing in use at Seneca Label. Flexography uses flexible plates with raised images to transfer ink onto various substrates. 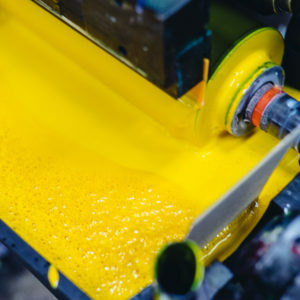 Four-Color Process, Process, CMYK, 4cp, full color: Four color printing involves the use of 4 colors(Cyan, Magenta, Yellow, and Black) to create a full color image. Hot Stamping: Hot stamping is a process in which the image is transferred to a label material by a combination of heat and pressure. Ink: Ink is the water or alcohol based quick drying liquid used in flexographic printing. Label Stock: Label stock refers to pressure sensitive material, usually in roll, sheet, or fan-folded form. Micron: A micron is a unit of measure referring to the thickness of material. Mil: A mil is a unit of measure referring to the thickness of material. Opacity: Opacity is a measure of the amount of light that can pass through material. Plate: A plate is the image carrier in flexographic printing. Register: Register refers to the positioning of the plate and die strikes as an item runs through the press. 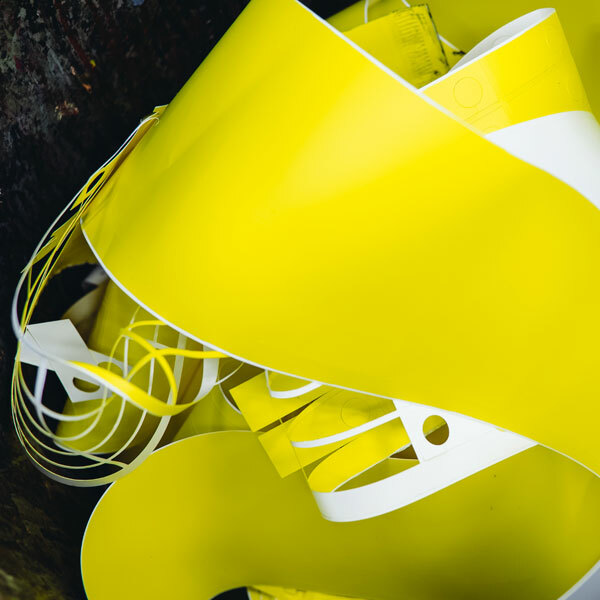 Varnish: Varnish is a protective coating that is applied to a printed label prior to die cutting. There are many different types of varnish available, which all accomplish different tasks. Web: The web is the distance from edge to edge, on a roll or material. Semi Gloss: Semi gloss is a facestock that is good for indoor product labeling. High Gloss: High Gloss is a gloss facestock that is good for indoor product labeling. Matte Litho: Matte Litho is a matte facestock that is good for indoor product labeling. Due to the material’s porous nature it is excellent for writing on after printing. Thermal Transfer: Thermal Transfer facestock is used in conjunction with thermal transfer ribbon to apply variable information. The material can be printed prior to running through the thermal transfer printer, which may apply a batch number, “use by” date, or other variable information. Direct Thermal: Direct Thermal facestock is used in conjunction with a thermal printer which uses heat (NO ribbon) to apply variable information. The material can be printed prior to running through the thermal printer, which may apply a batch number, “use by” date, or other variable information. Matte Radiant (Fluorescent): Available in Red, Green, Orange, Pink, and Chartreuse, these stocks work great with indoor applications that grab your attention. White Tag (No Adhesive): Tag stock is multipurpose and can be finished in sheets or rolls. 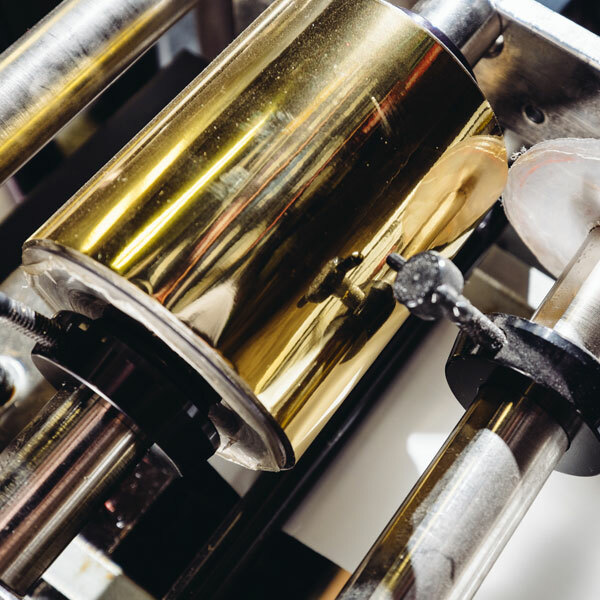 Gold Foil: Available in dull and bright sheens; all inks will print, but due to ink’s transparent nature, the entire label will have a shine, whether or not there is a printed image. Foil may be used to add flash to indoor labeling applications. Silver Foil: Available in dull and bright sheens; all inks will print, but due to ink’s transparent nature, the entire label will have a shine, whether or not there is a printed image. Foil may be used to add flash to indoor labeling applications. 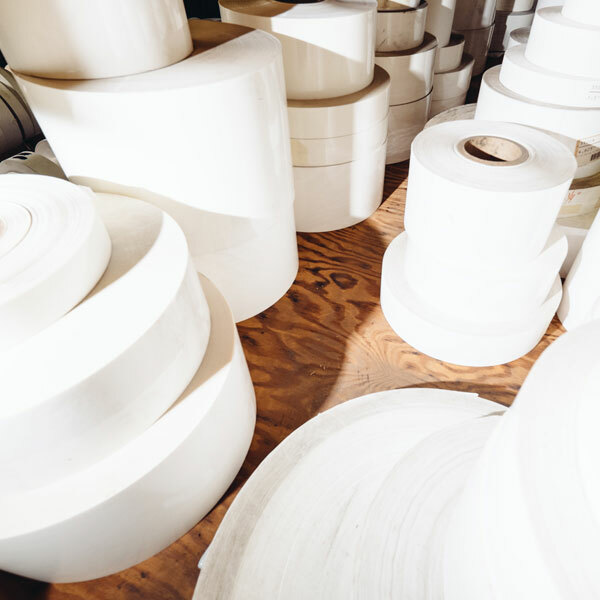 BOPP (Polypropylene), Polyester (PET), Polystyrene: Available in clear and white, these films will perform well in harsh, wet, hot, and cold environments. Clear material can be used to showcase product, through the material. Kimdura: a synthetic material more durable than vinyl. Tyvek®: an opaque white polyolefin film with outstanding tear strength and resistance to moisture. Velvet Lexan®: is a polycarbonate overlaminating film featuring a textured finish. Valéron®: is an oriented cross-laminated film with a great resistance to tearing, elongation, and abrasions. UL: Please contact us if you are interested in the UL approved items we carry. Once you obtain your barcode numbers from your respective countries GS-1 resource, Seneca Label can configure it into your artwork and print it for you. While you do not need a bar code by law, many retailers prefer product labels with barcodes already on them. A correctly sized barcode plays a tremendous part in whether or not it can be scanned correctly. As a rule, it is best to keep your barcode between the sizes of 0.5” x 1.25” and 2” x 3” to ensure maximum scannability. Whenever labeling industry specific product, it is important to check with the respective governing body, FDA, USDA, etc. to ensure that your label meets all of the necessary requirements. Seneca services many different industries and leaves the responsibility with the customer to verify that their packaging meets any requirements set forth by the regulatory agencies governing their industry. You can expect a speedy response. Send us your files to get started. Over 3,000 dies to choose from.